Is it still possible to talk about services firms as a meaningful category? 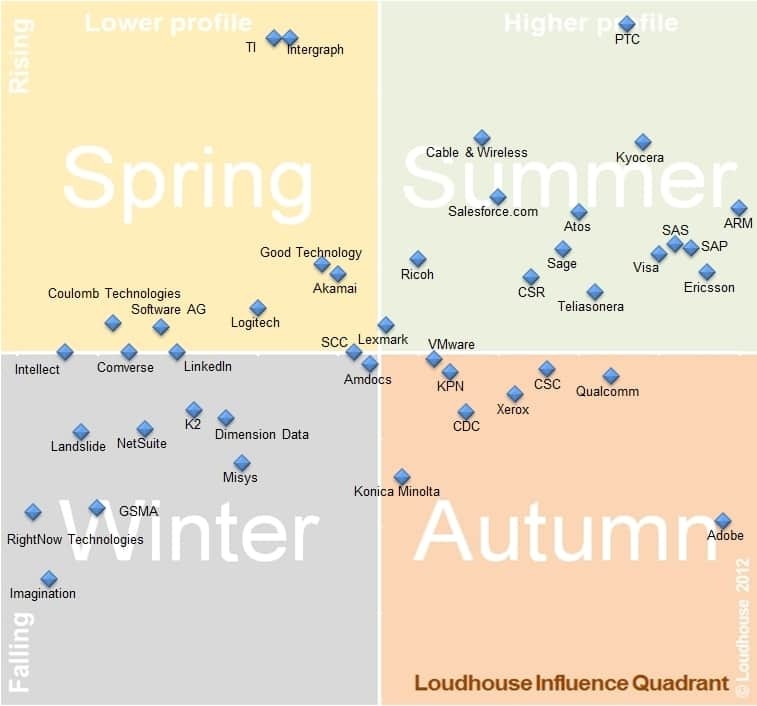 Take a look, for example, at the 2012 Influence Quadrant for enterprise solutions, which we made for the team at Loudhouse. Even though this IQ excludes the major Powerhouse vendors, which provide both services and technology, you can see that most of the enterprise solutions firms that analysts are writing about are also providers of services. The firms that are highest on the IQ, those with more research coverage in 2012 than in 2011, are mostly firms with a serious cloud focus. The dozen or so providers that have risen fastest on the IQ for enterprise solutions include a number of niche players, but also some major players. Salesforce.com, Atos, SAS and SAP stand out as firms that have accelerated their share of voice in analyst research. Salesforce’s acquisitions certainly drove a lot of analyst interest, but we’re increasingly interested to see firms publishing a lot of their CRM research in the weeks around Dreamforce. Nucleus Research stood out that month, with interesting research on CRM users’ propensity to switch, the ROI for ERP and Salesforce’s Chatterbox. Atos was another big winner of mindshare in analyst research, partly reflecting the successful merger of Atos with Siemens IT Solutions and Services. A number of firms have followed the new Atos closely, such as NelsonHall: PAC’s Nicole Duft wrote a notable article about its Social IT offer, and famous zero email policy. CIMdata wrote an interesting report about Atos’ plan to half its carbon footprint.